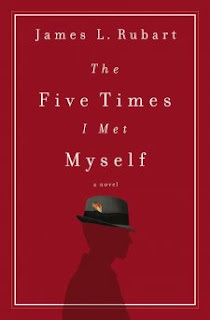 "The Five Times I Met Myself" by James L. Rubart is a novel that asks the questions: "What would you say if you met your younger self?" "What past mistakes would you fix?" "What wrongs would you right?" 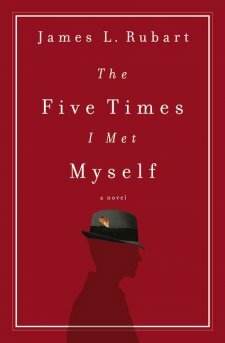 Brock Matthews is faced with these questions when, in a spin on time travelling, he meets his younger self in his dreams. His life is falling apart at the seams so when he finds he can alter it through dreaming, he goes for it. I was intrigued by the premise of the book, but what I liked least about the book was what I had expected I would appreciate the most -- the "Christian" element. The expert in this novel is Dr. Shagull -- a mentor and help to the main character. Dr. Shagull states: "God isn't a name any more than president is a name. It refers to a position only." He then goes on to describe Christ as "The most brilliant man who ever lived." After Brock shows his confusion at Christ being called a man, Dr. Shagull says: "I suppose that comes with being God and all." Dr. Shagull speaking in unclear riddles was tiresome. He does it again later in the book when talking about whether or not Brock is in control of his dreams. Most disturbing of all is Dr. Shagull's use of the Trinity to describe time travel. He draws a three circle Venn Diagram on a page and says of the middle: "I believe this is not only where past, present, and future meet, it's also the place where the Father, Son, and Holy Spirit intersect. They are separate, yet One." He goes on to say "If you can believe that this truth is real, ... then you can believe they can take you to a place outside of time where you can communicate with your younger self." I would have preferred if Dr. Shagull and his "Christian" references were left out of the book all together. His view on the Trinity's 'intersecting place' is not one that is Biblical in my opinion. -- the Father, the Son, and the Spirit." So, while I was intrigued with the time travelling tale of Brock Matthews, I was troubled by the spiritual references. I feel like the moral of the story and the themes of love, forgiveness, and the importance of family would have been stronger if it weren't for these unnecessary and unBiblical detours.